Fish maw is the dried form of fish air bladder. Fish maw can be divided into king fish maw, premium fish maw, grass seabass fish maw and fried fish maw in general. King fish maw and premium fish maw are the best quality and most valuable amongst the four types. Grass Seabass fish maw and fried fish maw are however more popular due to their economical pricing. Fish maw is also graded by their gender. Male fish bladder has thicker body and is soft and smooth, not easily dissolved in the mouth while female bladder has a thinner body and tender to bite. Fish maw is one of the precious traditional Chinese ingredients rated along abalone, sea cucumber and shark’s fin due to it's high nitritional content. Fish maw contains rich proteins and nutrients such as phosphor and calcium. It nourishes ‘yin’, replenishes kidney and boosts stamina. It is effective in healing weak lung and kidney, anemia, etc. It is suitable for consumption by any age group of either gender and is a kind of therapeutic food. The most important of all is that fish maw contains high viscosity gel protein and mucopolysaccharide which are important to lady’s skincare and capable of preserving fine complexion and invigorating blood circulation. Many Chinese people believe that drinking fish maw soup and eating fish maw will improve their skin and, for pregnant women, the skin of their babies. Furthermore, fish maw does not contain cholesterol and therefore it is a very valuable health enhancing ingredient suitable for long time consumption. How to identify fake fish maw? - Colour : Real fish maw has golden yellow colour whereas fake fish maw has light and whitish yellow unnatural colour. - Grain : Real fish maw has natural grain whereas fake fish maw does not have obvious and orderly grain. - Smell : Real fish maw has light sea water smell whereas fake fish maw has none and may carry chemical or plastic smell. It is therefore strongly advised to buy fish maw from reputable shops. 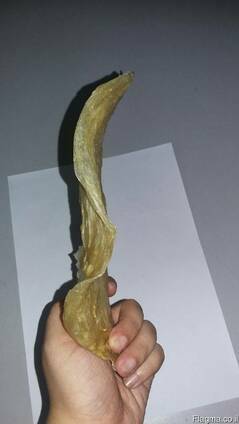 How to store dried fish maw? Store in cool and shaded area or refrigerated. - Soak fish maw in water for 12-18 hours until it soften.